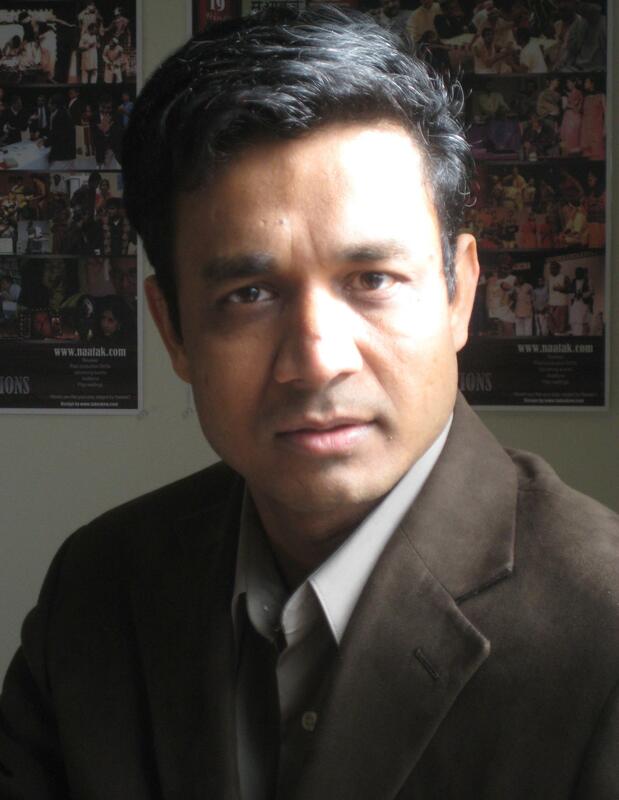 Sujit Saraf started his literary journey with his first novel, Limbo (1994, Harper Collins, India). 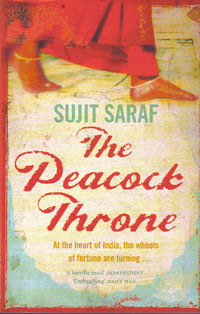 His second novel, The Peacock Throne (2007, Sceptre, UK) dealt with India’s socio-political upheavals in the last two decades, and was hailed as an important work of Indian fiction to have come out in recent years. His most recent novel is The Confession Of Sultana Daku (Penguin India, 2009). In 2010, the Chinese language rights for The Confession of Sultana Daku were bought by Morningstar Publishing, Taiwan. Born in Bihar and educated in IIT and University of California, Berkeley, Sujit works as an engineer for space missions at Lockheed Martin. He also runs Naatak, a theater company for Silicon Valley’s large South Asian population. 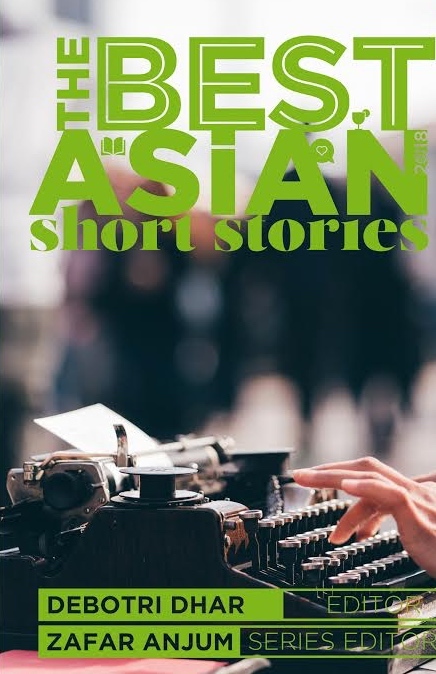 In this interview with Zafar Anjum, Sujit Saraf talks about his literary journey and shares his views on the ever-growing Indian writing in English scene. You come from a successful merchant family. People from such families are known for minting money, not for writing books. How and when did you decide to become a writer? I think I did spend much of my time making or trying to mint money (laughs). My first concern was to get a good job and for the last 15 years I have been continuously employed, therefore, in some sense, at least I’ve been trying to mint money. Over the years I have been writing a good deal. I think I first wrote when I went to a boarding school. My school was in Kurseong, Darjeeling, run by the Irish Catholic mission. They were the first ones who perhaps got me to read and write. They encouraged me to read a lot certainly. So, I think I first began to write in boarding school, I don’t know how good but…over the years I continued to write. Again, coming from a merchant family, writing as a profession was never seriously considered by me to be an option. The resistance to writing as a profession was too strong. Because I have been told ever since I was born that a man must have a full-time job and must earn his keep. I certainly intended to do that as a result of which I only write in my spare time. So, that’s pretty much what my writing career has been. I always dreamed of having an engineering job and writing on the side. How did your first novel Limbo come about? Limbo was written when I was in IIT. I don’t remember exactly how it came about. In those days I was seriously involved in student life in IIT. I was actively involved in students’ politics, you know, and I ran for an election and so on. And I remember suffering from setback in that election (laughs). It may sound trivial now but then I was in my fourth year in IIT and I was extremely unhappy about it. That left me with a lot of time in my hands. So, I think that gave me the reason to try and get back at people who sort of, you know, been obstacles in my path. Now, of course, after so many years I can hardly regard that as a commendable reason to write a book. But I thought I would write a book in which I would ridicule mediocrity (laughs). That might sound silly after so many years (laughs). I think that that was my motivation to write that book. I was then in my final year of IIT. I have not read any of those books but I have been hearing about IITians writing books. In fact, those books are set in IIT and so on. Limbo was written despite the fact that computers in those days were not used for word processing. In those days there were no Windows. And the tutor was quite strict. If he saw Word Star open on your computer, he will take you out of the room. There was a software called Sidekick which was a RAM resident programme. In those days it was a big deal. You had Sidekick opened and at the same time you could open Word Star, (using) that I used to write Limbo. The moment the tutor came up, suddenly Sidekick would bump up and there was a nice diagram (laughs) on the computer screen. So you practically wrote the novel in the computer lab? In fact, I wrote it only in the computer lab. No one had a personal computer in those days. I would only write it from midnight onwards. I would go to the computer centre at midnight when it would be empty. I worked until the early morning. And whenever this person (the tutor) came, I would open up Sidekick (laughs). That is so interesting…by the way, I saw on your website, between Limbo and The Peacock Throne, you had written some more novels? I have written a large number of novels, between Limbo and The Peacock Throne, only two of them I finished which I put up on my website as unpublished. When I was around 25, I rather arrogantly thought I would write an autobiography (we both laugh). I am 38 now (at that time of this interview) and I must say a man who is 25 doesn’t really have much to write about. But when I was 25 I thought I had a lot to write about so I wrote an autobiography. Of course, it was never published. After that I did write a few novels one of which was a fantastic (in the literal sense) account of my one year in India. In 1999, I decided to move back to India. I gave up my job in the US. I took up professorship at IIT Delhi. And things didn’t work out. I returned to the US and I ended up writing a novel about my experiences in India. It was of course a work of fiction, so much happens in the novel. Unfortunately, it is still unpublished. So, I kept writing until one of my books was picked up and got published. I actually did not write The Peacock Throne thinking that it would get published. I thought it was one of those unpublished books that I was writing, in the hope of, course, that some of them would get published. So how did you choose the subject of this novel, The Peacock Throne? The impetus for this novel itself is a newspaper article I read in 1996, about a tailor in Calcutta. He was a Bengali tailor, who stood for every election. He thought it was his duty to stand for elections–a citizen’s duty to stand for election rather than a citizen’s right. He had gone to South Africa to protest against Nelson Mandela’s imprisonment. He wrote a congratulatory letter to Prince Charles on his wedding to Diana. His election symbol was always a sewing machine. I found his story very funny. I think it was the Lok Sabha elections in 1996. I started wondering what would happen if such a man were to win an election. This perhaps provided the seed for the novel. I wrote a few chapters and quickly abandoned them. In fact, none of those chapters actually made it to the book. Now it began as a novel of the tailor of course whom I turned into a chaiwala, and whom I move from Calcutta to Chandani Chowk for many reasons. I am familiar with Chandani Chowk. Then the book grew organically, and other characters found their way into the book. The way you have written about all these characters, you know, including the prostitute and the sethjis, it seems that it has come from deep observation. What kind of research did you do for this book? I didn’t really do much research. I lived in Chandani Chowk for two years from 1985 to 1987, when I first reached Delhi as a student. I was in high school. When I wrote the novel, I used memories from those days, what I had seen and heard in those days. Apart from that I go to Chandani Chowk quite regularly, once in 2 or 3 years. In fact, many of the characters are people I indirectly know or they are composites of people I know. So, I am very familiar with the area and most of those characters. But some of the people in the novel had to be imagined. I do not know a Bangladeshi and I certainly do not know a Nepali prostitute. So some people had to be imagined and for those I had to do a little bit of reading to understand what are the ways in which they come to Delhi. Chandani Chowk is in some sense a point of intersection of many lives. It is true that there are many Bangladeshi boys in Chandani Chowk, that there are young girls from Nepal, that there are Marwari seths, there are of course sardars, there are politicians, so I had to do some reading for some characters, I keep myself aware of what’s happening in India…so I did not have to do much research as the novel is fairly contemporary. What kind of reaction did you get from people of Chandani Chowk? Did you get any reaction from them at all? Well, that’s the story of Indian writing in English. We write about people who do not read us, and the people who read us are not people who we write about. So, no, to the best of my knowledge, no one in Chandani Chowk has or will read it. My uncle has a large number of shops in Chandani Chowk. He, of course, has a copy of the book but maybe one of my cousins will read it. So far the only reaction I can point to is that of Indians. The problem with Indians, with the books in English, with their expectation of books in English, one, they are most conscious of the image of India that is projected outside of India through the book. Like one of the interviewers in India asked me if Deepa Mehta’s film Water should be India’s entry to the Oscars considering that it did not portray a good image of India to the world? I then wondered why should it be Deepa Mehta’s responsibility to work for the tourism department of India or any other department whose job it is to project a favourable image of India? So, most Indians who have read the book seem to be disappointed as the book does not talk about the world is flat and how Bangalore has become the new Silicon Valley. When I was in Bombay, I picked the Times of India, one of the big bold headlines somewhere in the 3rd or 4th page was a comment by some Englishman. 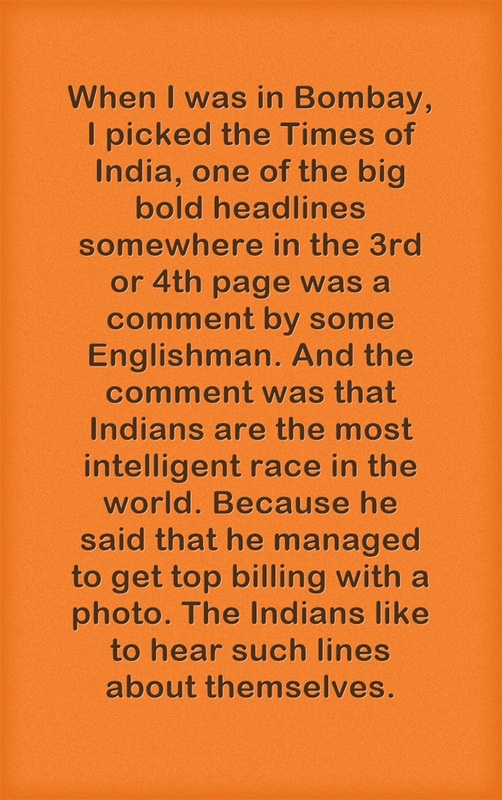 And the comment was that Indians are the most intelligent race in the world. Because he said that he managed to get top billing with a photo. The Indians like to hear such lines about themselves. And when India is portrayed just how it really is, they get offended. This is the reaction of the naive Indian. I am not going to suggest that everyone who reads the book is that naive. The other reaction which I got was that familiarity breeds contempt. Many of my readers are of course also familiar with such people. Therefore they find it a little annoying that I should make a comment on these people. I also feel that Indians who have an association with Delhi seem to be slightly offended by the book. Offended is a strong word. They seem to be slightly antagonized. Over all, I didn’t have much of reaction from India because there have been only four or five reviews in India. Two or three positive and two or three negative. So, I still don’t know what Indians think of this book. I hope more Indians will read it and I will have more reactions which will find their way to my hope. But I have a feeling that not many people in Chandani Chowk will read it, even if the novel was in Hindi, I doubt many people in Chandani Chowk would have read it. Reading the reviews, I get the sense that people are disappointed that this is not the representative Delhi novel? Yes, which, of course, is no concern of mine. I have written the book but the marketing line is chosen by somebody else. I only wrote what I wrote. It was a novel not meant to be about Delhi. It was a novel about a few people in Chandani Chowk. All literature attempts to be universal through the particular, right? You write about a person and you hope that you also end up saying something that applies to other persons. So, while I did write about the few people in Chandani Chowk I do hope that the novel ends up saying something about Delhi and about India. But it isn’t really a novel about Delhi, which is what people seem to expect from it. It is certainly not a novel which is intended to project a certain image of India. I am completely uninterested in what image it projects. I don’t even care to project any image at all. Fair enough. I would like to talk about two criticisms of your novel. One criticism is that the book tends to be verbose. The other criticism is that why haven’t you stepped out of the Chandani Chowk area and covered other places in Delhi? (Laughs) About the book being verbose, I really don’t know if I agree or disagree. I always imagined this novel unfolding in Hindi. When my characters speak, except Chitra’s character, no one in the novel speaks English. So I imagined them speaking in Hindi and then I translated that into English. I don’t know if that leads to verbosity. I cannot imagine my characters in the novel already speaking in English. It was not as if a case was made somewhere on the front page that this is a novel that will take you on a tour of Delhi. For that matter, I am not promising you a tour of Chandani Chowk either. It goes to those parts of Chandani Chowk that have a relationship with my plot. And when my character’s stories take them outside Chandani Chowk, the novel goes outside Chandani Chowk. Like the Babri Masjid was demolished in Ayodhya, and my Bangaldeshi boy comes from Bangladesh and the Nepali girl comes from Nepal. So, when necessary, they step out. I also feel that Chandani Chowk is indeed a unique street and it holds a unique place in Indian history. It has been after all the seat of the Mughal Empire–throughout the Mughal Empire since at least 1548 when the Red Fort was completed until 1857 when the empire ended. And beyond that, from 1911, when the British moved their capital from Calcutta to New Delhi. Certainly for the Mughals and part of British rule from 1911 to 1947, Delhi has been the capital of India. Although the Mughals built Shajahanabad and the British built New Delhi, for a significant portion of Indian history, Chandani Chowk has been the seat of power. So I felt that events in Chandani Chowk could in some way have a relationship with national events. That perhaps is no longer true but I’m speaking historically. Going back to the writing process, how many years did you take to write this huge book? I began writing it in 1996 and then I quickly abandoned it. So it has been gestating for years. The actual writing took a year, between 2003 and 2004. Writing 750 pages in one year. That’s fast. I spend a lot of time thinking about the book. I write reasonably fast. I mean when I do write, it is much like manual labour, putting on paper what I had more or less thought out beforehand. And how many drafts did you do? I don’t rewrite too much. I think about two drafts. Of course, there was some editing by an editor after that and so on but I myself wrote two drafts. You have a full-time job. So how do you manage to divide time between work and writing? It does become difficult (laughs). I write only on weekends. I try very hard to manage my time. When I sit down to write in a cafe I try to make the best of it. I try very hard to be efficient at writing. Maybe that’s one reason I don’t do too many drafts. I just think the novel through in great detail and when I put it down on paper it is not too far from my final thought. To some extent the fact that I have a fulltime job does slow me down and so far I have accepted that. I would be perhaps writing more if I wasn’t working. I work five days a week and I write two days a week. What kind of writers do you admire and read? I like a wide variety of writers. More than writers perhaps I like a few books. I really like a couple of books by Peter Carey. Novels like Oscar and Lucinda and True History of the Kelly Gang. I really like In Custody by Anita Desai. I really like one of the older books of Vikram Seth called From Heaven Lake. I also read a large number of Hindi books. I read books by Premchand, Rameshwar Dayal Saxena and so on. I really like Godan. I like a few short stories. 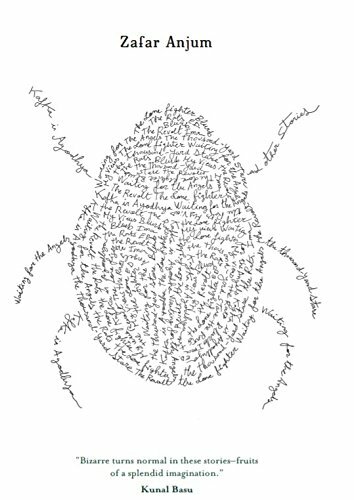 There is a story by Jean Paul Sartre–in English it is called The Wall, which I really liked. I like a couple of novels by Camus, like The Outsider. I really liked The Plague. I read somewhere that you also write screenplays and perform nataks or plays? I run a theatre group in this area (San Francisco). In the last seven or eight years I have done two plays. I have also staged many of those plays through my theatre group. When I was reading your novel, in the first few chapters, where the characters were getting introduced, I had a feeling that the scenes were unfolding like in a film. Did you use cinematic or theatrical techniques to write The Peacock Throne? Yes, I have been writing quite a few screenplays. I have made a couple of movies (laughs). The Peacock Throne was written sequentially. By the way, I always write chapter 1 followed by chapter 2. So, the last chapter was indeed written last. And it began as a play in that in a play when you need to switch scenes you just drop the curtain and follow it with another scene, with a new set and a different set of characters. When you need to have a big movement in time, suppose you want to say one year passed or six years passed, typically you drop the curtain and you say Act II, which is what I did. From 1984 I said 1990. And you may have noticed that all of 1984 unfolds in 14 -15 hours. The Part 1 begins around 9 or 10 in the morning and ends by the time maybe 10 pm in the evening. Part 1 almost moves in real time almost like a play. So, The Peacock Throne is written a lot like a play but as I moved one, Part 2, Part 3 and so on, you will notice that other parts are more novel-like. They just move swiftly. I used lines like two days passed, and three days later. So, I like to think that it began a little bit like a play and ended up a little bit like a novel. What do you think about the current wave of Indian writing in English? Recently someone argued in an article in The Guardian (UK) that many Indian writers are now moving from the West to live in India, to live and write from amidst their characters, and claiming that their writing in more authentic about Indians than what the NRI writers have been trying to write in the last few years? What do you make of such arguments? It’s a little complicated. I think the standard Indian writer in English, over the last 40 or 50 years, if you discount the early writers like Raja Rao and R K Narayan, has not lived in India. He or she has lived in Britain or then in the US. They neither live in India nor do they write in the language of their characters. I am deliberately saying the language of their characters. Because I don’t want to go into the argument whether English is an Indian langauge or not. That is irrelevant. What matters is: would the characters in that novel be speaking in English? Now depending on where you set your novel–if you set in Hauz Khas in Delhi, perhaps they would be speaking a little bit of English. But if you set it in a small town in India, they wouldn’t be speaking in English. So the standard Indian writer in English lives abroad, writes about people who perhaps do not speak in English, and writes for an audience which also lives abroad. 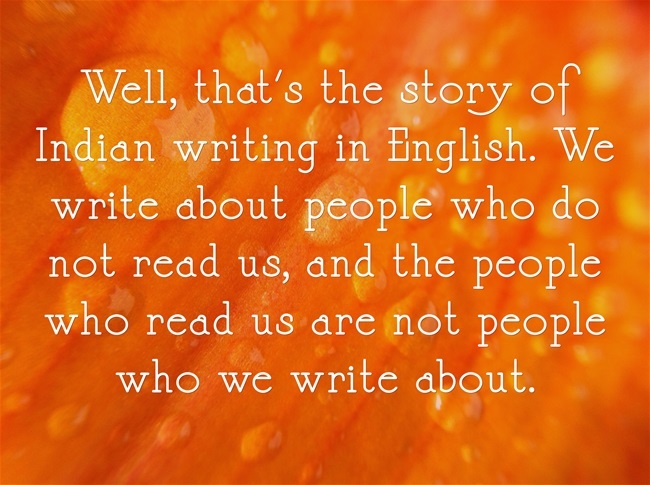 Primarily, the audience of an Indian writer in English is in Britain and US, not in India. There is certainly something dishonest about this whole affair. And although I myself live abroad, I think only good can come out of the fact that Indian writers who write about India are now choosing to live in India. 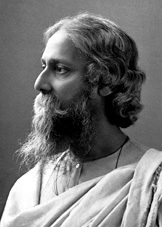 Indian literature will truly have a rise when a large number of Indian writers live in India, write about Indians, but more importantly write for (he emphasizes ‘for’) Indians, and are praised or criticized by the same people who people their novels. When Ian McEwan writes a novel set in Britain–I just happened to read Atonement a few days ago–the characters in Atonement fought in the Second World War, lived through the post-War period in Britain, and by the time the 1990s came around they themselves were in their 90s. Now the people who read the novel either themselves fought in the war or have cousins who fought in the war or at least belonged to the same culture, the same system which fought the war. So, he is not just writing about some people. He is writing for the same people. And is, therefore, being judged by the people who are perfectly qualified to judge him. I think that places a far greater burden on an English writer than on an Indian writer. And if an Indian writer lives in India, and writes for Indians, the same burden will be placed on him. Do you think India has the kind of critical establishment which exists in the UK or the US? No, certainly not. Indians are still too obsessed, coming back to how we started our conversation, with our image abroad. Indian readers and critics are too obsessed with that image projection. They are not introspective enough. We do not have a culture of excessive analysis and introspection. But it will develop if there are some Indian writers living in India, writing for Indians. Some of them will turn critics, I’m sure. But no, I don’t believe that India has the tools to study and judge its own writers right now. (Part of this interview appeared in India Se magazine several years ago). Posted in Authors, Book and tagged Peacock Throne, Sujit Saraf. Bookmark the permalink.